After a long period of relatively slow change and development, the practice of psychotherapy entered a phase of vigorous experimentation in the 1960s. Greatly increased public recognition of the role of psychological approaches has brought about a dramatic upsurge of demand for mental health services on the part of broader segments of the population than ever before. Many kinds of people now seek aid, and display a greater variety of symptoms and life problems than are recorded in the earlier case-history literature. The professional response to this new demand markedly increased the professions creativity and imagination, as this volume outlines. While it is difficult to devise a precise category to cover all forms of such experimentation in psychotherapy, one major characteristic has been an increase in activity. The non-directive or client-centered therapist frequently speaks almost as much as his client, yet he is not considered active, since he attempts to limit his communication to the reflection of the clients feelings. More frequently an attempt is made to distinguish between insight-oriented therapies and active therapies in terms of differing goals. Active psychotherapy is seen as being concerned with techniques that focus directly on the removal of symptoms, such as anxiety or maladaptive overt behavior. The need to establish a clear dichotomy between insight and behavior modification has often been challenged: many of the therapists who stress insight do so in the belief that increased insight, no matter how arrived at, will modify overt behavioral anxiety. 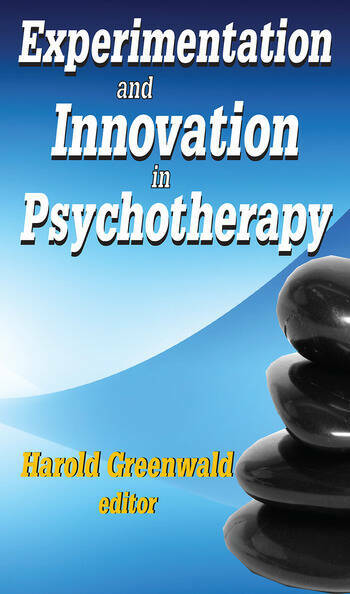 Experimentation in Psychotherapy exposes the reader to a wide variety of therapies. Although changes in treatment methods, and a more short-term orientation, have limited some future developments in the field, this volume admirably describes the techniques traditional therapists can effectively employ, given the patient's strengths and limitations.